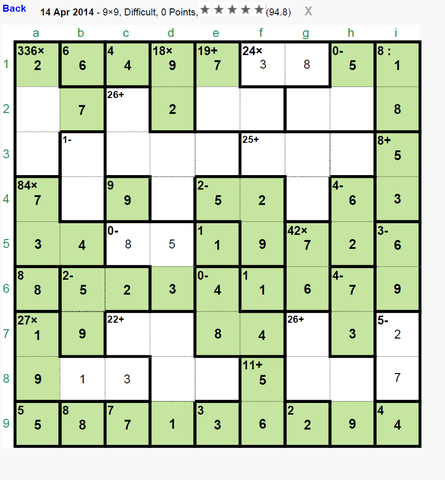 Does anyone have an elegant solution to yesterday's 9x9? I ultimately was able to overpower it but my effort was ugly. Way too much trial and error. I suppose you are referring to April's 14 9x9 since on Sunday it was not a 9x9. Well, as you well know, the full solution requires many steps and it’s a long process. What I do first is, as usual, to place the “immediate” numbers and candidates: "24x" = [3,8], i1 = 1, i2 = 8, a7 = 1, a8 = 9 (“27x” = [1,1,3,9] and 9 is not a submultiple of “336x” or “84x”), d9 = 1 (h9 cann’t be a 1 because a sum of 25 in g7-g8-h8 would require [7,9,9] or [8,8,9] both invalid), “18x” = [2,9], "42x” = [6,7] and in column “i”: “3-" = [6,9], “8+” = [3,5] and “5-" = [2,7]. Next, looking to column “a”, I multiply 336 x 84 x 8 x 1 x 9 x 5 and divide this by 9! = 362880 (multiplication rule to column “a”) finding: b2 x b5 = 28 = [4,7]. This means that a 9 or a 5 cann’t be in “1-” (b3-b4) then b6-b7 = [5,9] >>> c6 = 2. The only possibilities for “336x” would be [3,4,4,7] and [2,4,6,7] since no 8’s are allowed. The first option is immediately suppressed because a1= 7, a2 = 3, b2 = 4 >>> c2 + “0-” (g2-h1-h2) = 16, that is, c2 even = 6 (unique) and “0-" had a sum of 10 with a 5 as the higher number but [1,4,5] or [2,3,5] are now invalid. Consequently “336x” = [2,4,6,7] and “84x” = [3,4,7]. Now it’s easy to see that candidates for “0-” (c5-d5-d6) are [3,5,8]: No 1’s or 2’s or 9’s are allowed and [3,3,6], [4,4,8] are invalid (due to two 6’s in rows 5 and 6 and c1 = 4). So we are only left with the combinations [3,4,7] and [3,5,8], but [3,4,7] is not possible since this would force a4 = 7 (7's in rows 5 and 6) and a5-b5 = [3,4] against the hypothesis; consequently the "0-" cage is [3,5,8]. 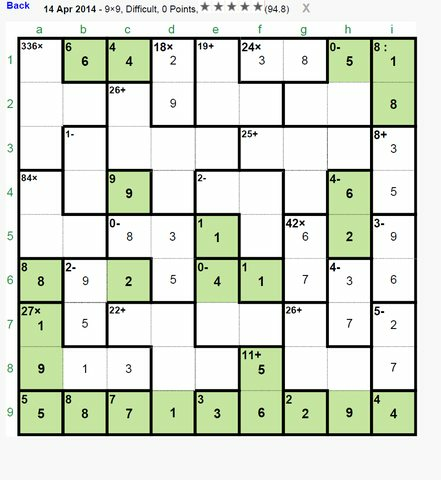 Now let’s define the cage “11+” in f8-f9; this cage cann’t be [2,9] (f8 =2, f9 = 9) because of h9 = 6 what would make impossible to place a 2 in row 5, so “11+” = [5,6] >>> f8 = 5, f9 = 6, h9 = 9. This drives to h1 = 5 because e1 = 5 would necessarily require e2 = 9, f2 = 5 repeating a 5 in column “f”. Reedited to continue a little more. 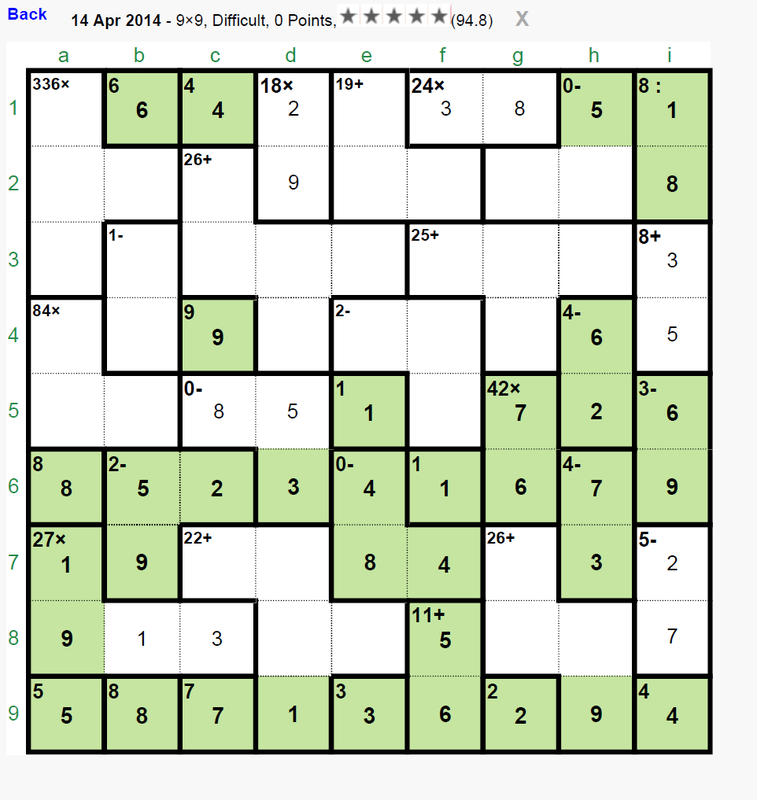 Column “h”: A 2 is not possible in h8 because a sum of 15 would not be possible in g7-g8. And a 2 cann’t go to h2 (necessarily h3 = 1) or h3 (necessarily h2 =1) because in both cases the 6 of column “h” should go to h8 which is impossible because g7 + g8 should sum 11 which cann’t be obtained in those positions. And we can observe that h4 or h7 must be different than 2 (both producing an additional 6 in rows 5 and 6) so h5 = 2, h4 = 6. And now we repeat a similar reasoning this time using the possibilities of the 7 in column “h”. A 7 cann’t go to h8 because a sum of 10 would not be possible in g7-g8. And a 7 cann’t go to h2 (necessarily h3 = 1) or h3 (necessarily h2 = 1) because in both cases it’s not possible to place a 3 in column “h”, consequently “4-” (h6-h7) = [3,7] and the 4 of row 6 is only allowed in e6. Row 5: Since f8 = 5 we cann’t place a 5 in f5 so the 5 of row 5 must be in c5-d5, consequently d6 = 3 and this fulfills row 6 as shown. 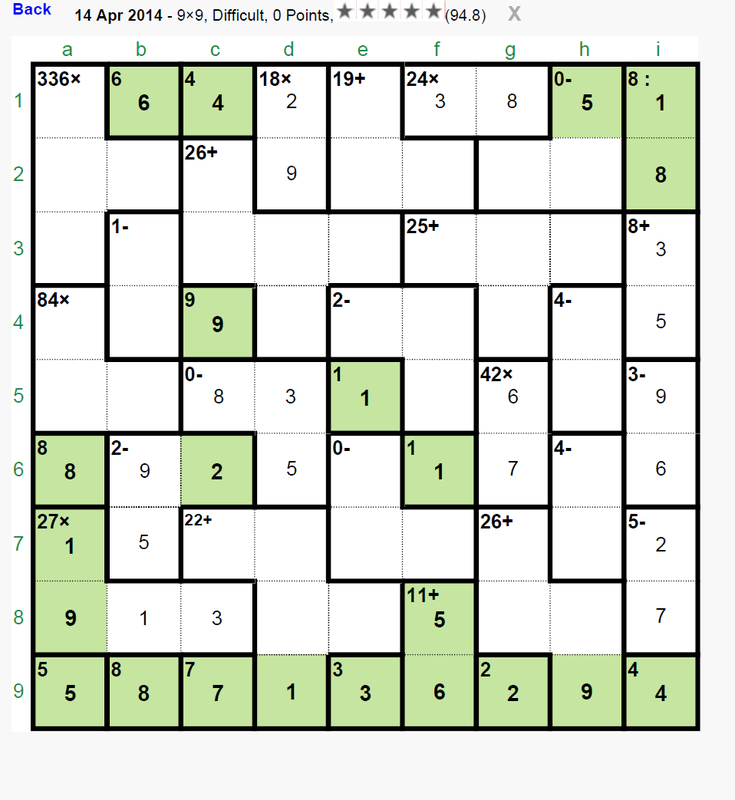 Additionally, using the addition rule applied to the three bottom rows (3 x 45 = 135 in total), we conclude that e7 + f7 = 12 >>> e7 = 8, f7 = 4 (unique). 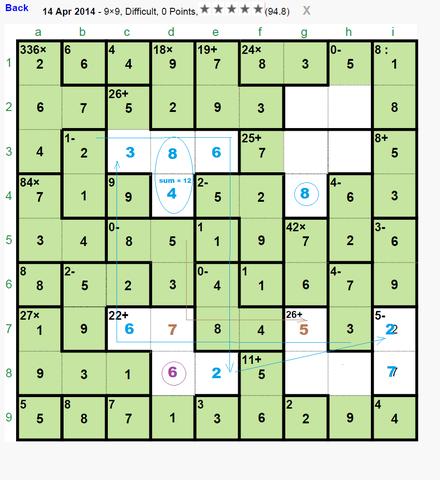 And from here: a4 = 7, b5 = 4 (we remind here that b2-b5 = [4,7]), a5 = 3, f5 = 9, e4 = 5, f4 = 2, i4 = 3, i3 = 5. Also b2 = 7, a1 = 2, d1 = 9, d2 = 2, e1 = 7 (e2 = 9, f2 = 3, f1 = 8, g1 = 3, f3 = 7, c2 = 5, a2 = 6, a3 = 4). And, besides that, b3 = 2, b4 = 1, b8 = 3, c8 = 1. And to complete the solution from this point is easy (next two graphics). Last edited by clm on Tue Apr 15, 2014 10:31 pm, edited 7 times in total.